Carpenter ants are one of the biggest ants in Florida. They range in size between ¼ inch to ½ inch and their colors vary between black to red. 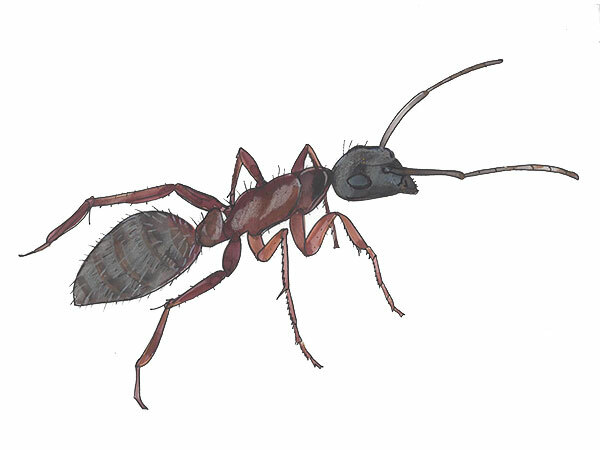 Winged carpenter ants can resemble termites and often confuse homeowners. The carpenter ants body is clearly segmented between the head, thorax and abdomen whereas the winged termite has very little definition. In their natural environment, carpenter ants like to create nests inside rotten tree stumps, moist branches or hollowed out logs, usually in a forest setting. Carpenter ants have become a major threat to homes in Florida. They invade homes in search of food and will establish colonies in areas where they can find moist or decaying wood. Carpenter ants commonly nest near windows, decks, roof eaves and other areas that contain moisture. Normally a nest established inside a home is merely a satellite nest, which leads to a much larger nest outside the home. Carpenter ants can have multiple satellite nests, which lead to a central nest where the queen rules the colony. Inside the carpenter ants colony, thousands of workers tend to the queen and her tan colored eggs. Sometimes a colony can hold more than one queen. Each Spring/Summer 100-400 male and female carpenter ants will grow wings and leave the colony to create a new colony of their own. Soon after the male and female carpenter ants mate, the male dies and the female moves into a suitable piece of wood to lay her eggs. Her eggs will hatch into worker ants, which will tend to her as she takes on the responsibility of laying eggs for the rest of her life. It takes at least two years before a new ant colony can release winged reproductive male and female ants. Carpenter ants eat insects, fruit, honeydew and plant nectar. They are foragers and will eat both live and dead insects. The majority of carpenter ants will hunt for their food alone at night. Sometimes they will search for food in teams or trails. Once a food source is discovered, they will leave a pheromone path, which alerts and directs the other members in the colony to the food source. Once an insect is discovered, the workers will carry the nutrients back to the nest to feed the other members. Do Carpenter Ants Eat Wood? Carpenter ants do not eat or consume wood because they cannot digest cellulose. Carpenter ants are not classified as wood destroying organisms, however they still remain a serious pest in Florida. Carpenter ants build nests inside decaying or damp wood by chewing the soft texture with their mandibles. They build galleries and tunnels inside wood, which lead to elaborate nests where the carpenter ant colony thrives. Carpenter ants will chew and excavate rotten wood in order to build these nests, but they cannot physically consume wood. Trim all bushes, trees and shrubs away from the house. This makes it more difficult for the carpenter ant to find the home. Also, pulling mulch and organic debris away from a structure can reduce the chance of a carpenter ant infestation. Seal up any cracks and crevices with caulk. Replace damp or decaying wood around the home to limit nesting environments. Keep food stored in tight-fitting containers to decrease food supplies for the carpenter ant. The best way to eradicate a carpenter ant colony is to locate the nest and treat the nest with insecticide. When selecting an insecticide, always read the label before application. If baiting, use a slow activating chemical so the carpenter ants have enough time to carry it back to the nest and share it with the rest of the colony. How to get rid of ants in your house? We answer this question everyday, costly and efficiently for customers in Sarasota and Manatee Counties. Indoor ant control made easy with Cloud Termite and Pest Control. We service Parrish ant control, Anna Maria ant control, Holmes Beach ant control, Palmetto ant control and surrounding areas.